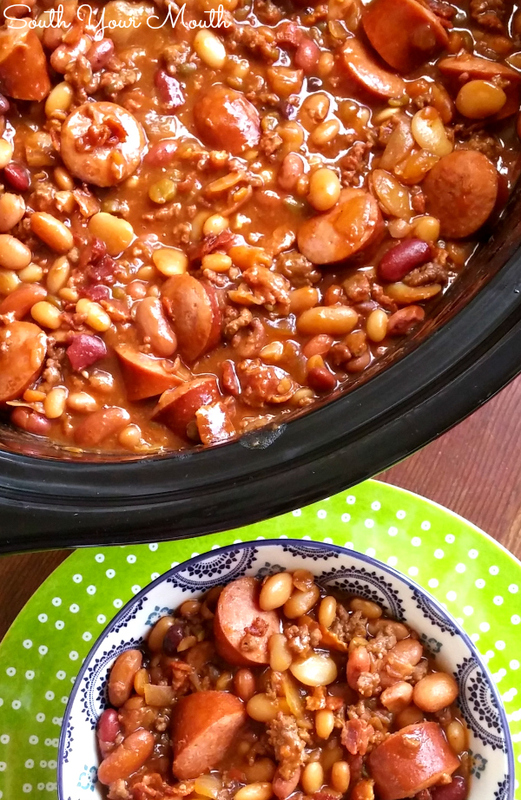 This slow Cooker BBQ bean recipe with smoked sausage, bacon and ground beef is the perfect side dish for feeding a crowd! I make all sorts of baked beans. I make my regular Cowboy Beans when we’re having a cookout and I want something with a little extra pizazz. I make my Boston Baked Beans when it’s cold and I have time to love on those suckers (it’s a process, lemme tell ya, but they’re worth it). 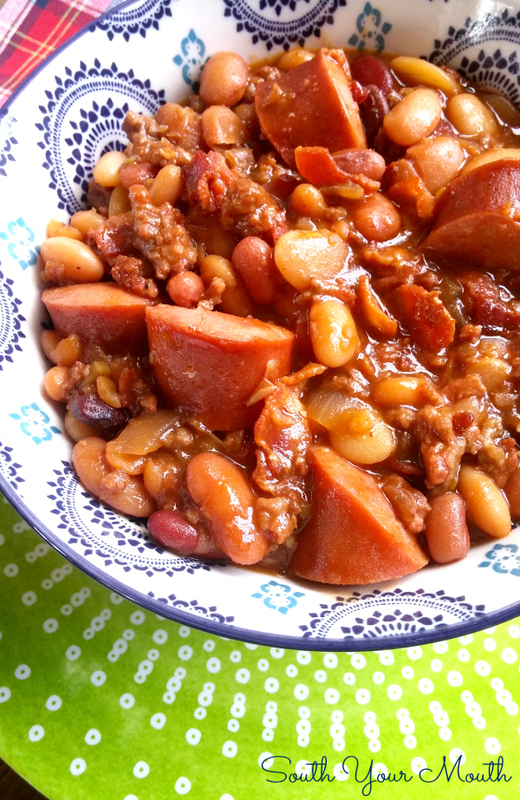 I make my Southern Style Baked Beans when I want that ‘wow factor’ from all the bacon on top! And I make my Borracho Beans when we're having Mexican dishes like carnitas! But sometimes you got to pull out the big guns. Sometimes you want to make something that’s going to make a scene! One of those dishes that, when someone walks by at a pig pickin’, they stop in their tracks and cause a pileup in the buffet line. That’s what this recipe is. It’s a triple-threat with ground beef AND bacon AND smoked sausage. If you’re looking to make a super hearty, scratch-made barbeque bean recipe, this is the recipe for you! As I usually do, I started with Hurst’s beans because I sincerely LOVE the 15 Bean blend but also because I knew the ham flavored seasoning packet would ratchet up the meaty flavor factor even more. If you can’t find the 15-bean soup mix in your local grocery store, ask for it! My grocery store now carries all sorts of products they didn’t have before simply because I asked for them. Just ask the cashier who to talk to to request a product and s/he will point you in the right direction. My store has a list at the Customer Service desk where they notate products their customers' request. SPECIAL NOTE: I listed this in the recipe below but wanted to pop this note up here as well. This recipe is intended as a side dish. It was created to taste a lot like Southern-style baked beans. I read a comment where someone said this was too rich to be an entrée so it occurred to me I might better point out that I created this dish to be both rich and slightly sweet as it is not a main dish, but a side. Just like Boston Baked beans are cooked in molasses and southern-style baked beans are usually made with brown sugar, this recipe also has it's own unique sweetness. 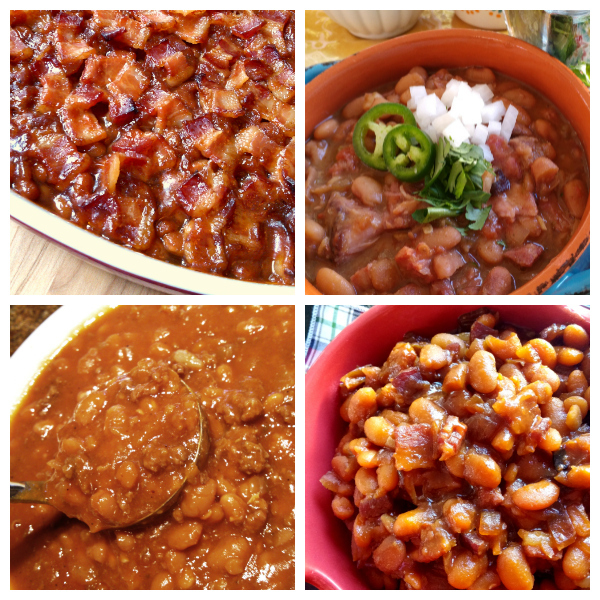 Check out my other favorite BEAN recipes listed left to right in image below. I have only worked with dry beans once before and it was a disaster! 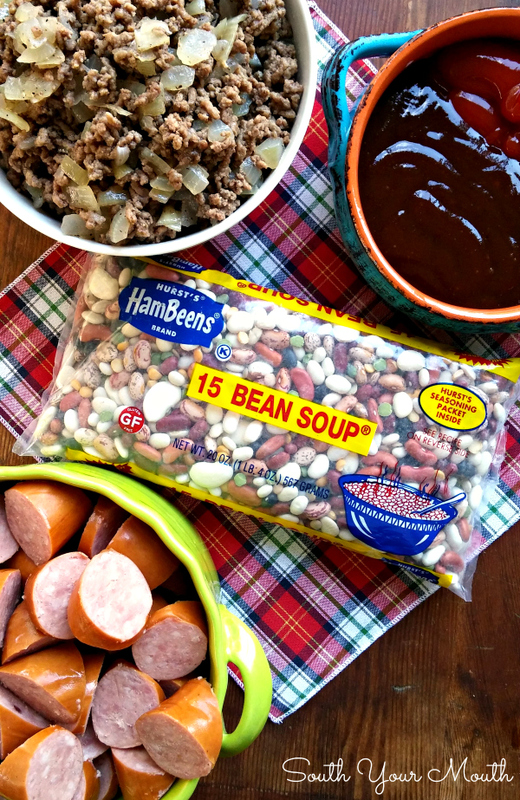 I want to make this for our Thanksgiving camping trip, do I need to soak the beans prior to putting in crock pot? Or just rinse and toss in crock pot? Just toss them in! You CAN soak them overnight to cut down on the cooking time a little if you prefer (won't take as long to get them tender in the first step). COULD I JUST USE KIDNEY BEANS INSTEAD OF ASSORTED BEANS ? I'M A VERY PICKY EATER & NOT A FAN OF ASSORTED BEANS. THANKYOU. 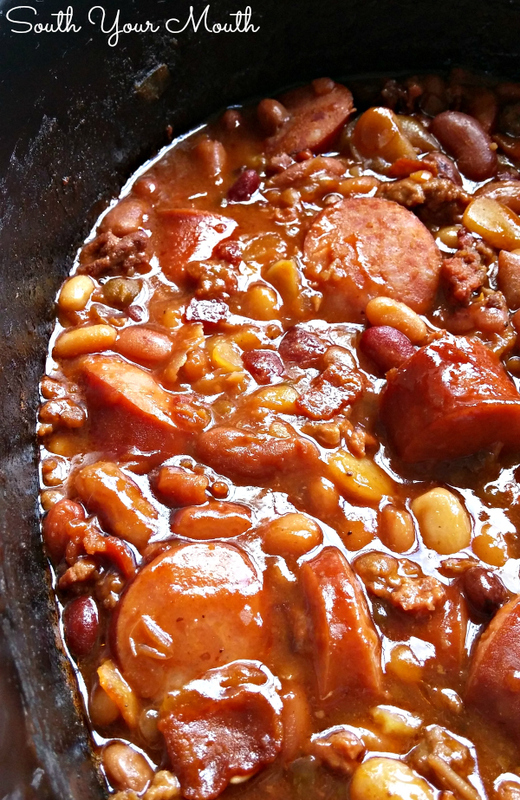 I make something similar but I substitute the dry beans with pork and beans, ranch style beans, and kidney beans, ground beef for ground deer meat. +everything you add. Oven for 1 hr at 350. Yummy. What's the seasoning packet consist of its not clear. The ingredients are listed on the package but I think it's mostly salt and smokey flavoring. Even though you said it's meant to be a side dish, if I'm going to spend the money to put 4 lbs. of meat in there - it better be a main dish meal lol! What do you think about serving it over rice as a main dish? Maybe cut out the brown sugar? This is what I make when I want something special, when I'm feeding a crowd or when I'm taking something to a gathering. I'm literally making this right now to take to a pig pickin' we're going to tomorrow. I figure if my buds can spring for a whole hog then stay up all night long cooking it, I can spend 20 bucks to make a giant pot of beans worthy of the occasion ;) As far as making this a main dish with no sweetness, you'd have to totally reconstruct the recipe because the ingredients that make the sauce are all sweet (molasses, ketchup, BBQ sauce & brown sugar). You've given me an idea for a new recipe concept though! You're not the only one who has inquired about this so maybe I'll try to concoct a similar recipe that's not a "baked beans" type recipe, but one that's purely a savory, main dish. Wish me luck .. Making them today for a Christmas party. That answers my question of does it freeze well.......and I'm thinking cut out the black strap and add a little more heat. Eager to test. From new Mexico. This looks YUMMY!! I love 15 Bean soup made the original way but this is taking it up a notch. I will cut it in half as it is just the hubs and I. I will also leave out the molasses and brown sugar because we don't like sweets in our food and my BBQ sauce of choice is Rudy's BBQ sauce from Rudy's BBQ here in Austin, TX. Not sweet but has a little kick to it. Jalapeno's are in order too. Can't wait t omake it. Southeast Missouri here. I'm trying this today. With no molasses. I will let you know how we like it. First time. I'm making this for a main dish. Just my wife and I.. I have been making my version of cowboy beans for 25 years. It is one of my grown son's favorite meals. Of course it is so good with cornbread. N.C. snow coming, so just put the beans in the crockpot. Not sure if being snowed in with guys and beans is a good idea. But excited for a good hot meal! I'm from Canada and found the 15 bean package but there is mo seasoning package inside it's a different company. Any suggestions what to add. Hi Wanda, I'd add 1 tsp salt then 1/2 tsp each of garlic powder, onion powder and paprika. The biggest thing would be to add several drops of Liquid Smoke if you can find it! Best, best, best beans EVER! 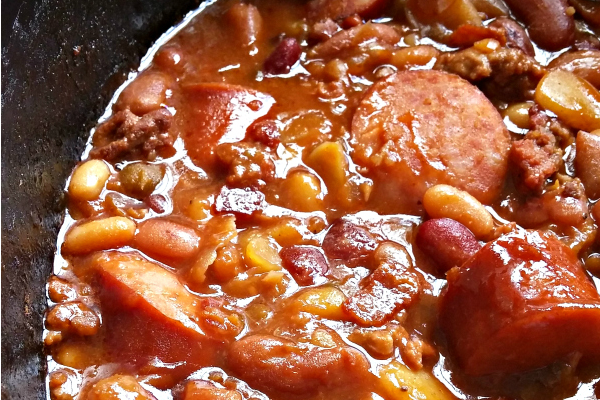 I grew up on my mothers baked beans and they were good but nothing even close to this recipe. I made a batch of cornbread and spooned your beans over the top. Thank you for sharing this wonderful recipe! LOL thank you!! I'm glad you enjoyed them! I used to make this quite a bit when my kids were growing up. We all loved it. My recipe included sliced apples, which made it so good. I've missed it so I think I'll have to start making it again. Yum! Just saw this recipe and plan to try it for my superbowl menu. Can't wait!! Honey, I would totally sit down with a spoon and bowl full of this! Boil beans for a few minutes, drain, add water & boil again, drain and proceed with recipe. These two extra steps will illuminate 90% of normal gas associated with this type beans!! Is it all possible to cut this recipe in half? I don't have a very big family. Besides I would eat this as a meal. That would be hard to do with the beans. It freezes beautifully, though! I'd make the whole recipe then just freeze the leftovers. Are Hurst beans available in Canada? I know you can order on Amazon (and I think Wal-Mart) but let me check with my contact at Hursts and get back to you! Side dish? Nah. If it's got enough meat in it,(which this does) it's a main dish casserole for me! I concur wholeheartedly! One of my favorite meals as a kid was simple Beans & Wieners with a side of either potato salad or cole slaw!! This would be a great grown-up version. This recipe is perfect! I love it. The name certainly fits, like a fancy baked bean recipe is what it taste like. And I’ve never been a huge fan of baked beans. My husband and I love spicy so the recipe as is was fabulous. Pairs beautifully with the sweetness of the bbq sauce & ketchup. Would be the perfect compliment to any potluck or food gathering. Protein packed heaven. Thanks for sharing! Debra! I want to kiss you on the mouth!! YES! Everything you said!! YES!! Every time someone says they're going to serve this as a main dish (despite my notes and comments) I cringe a little because I'm scared they won't be happy. In the same way I wouldn't be happy if someone gave me a bowl of Boston Baked Beans for supper. Like you said, this is a "fancy baked bean" recipe. It is meant to be served with meat and savory dishes. I love beans and I would enjoy this as a main dish with a side (potato salad, green salad, cole slaw)! One of my favorite meals as a kid (and well into my 20's) was Beans & Wieners so this would be a great upscale version for me. What is the best bar b que sauce for this reciepe? I've used Sweet Baby Rays and the Kansas City style sauce they sell at Aldi and love them both in this! Has anyone attempted to can these? I'm really trying to build a stockpile, and my husband loves these. I would like to do this as well. Hope someone out there has tried it. Where's the RECIPE for Cajun Ham & Beans???? All I got was a photo. Want to MAKE it. I'm adding 1/2 cup of Jack or Jim to help cut the sweetness. It says 20 servings. What size is 1 serving considered to be? 1/2 cup? There are approximately 20 1-cup servings in this recipe. Can you cool the beans one day and then put it all together the following day? Soaked the beans overnight, drained and added 6C water to beans in crockpot. Cooked on medium for 5-6 hours and found them to be inconsistent in texture and quite dry. Threw them out and went with canned. Hmmmm. I am seriously scratching my head on this... I never soak mine overnight and even without that extra step, mine are always perfectly tender. I've heard salt makes them tough so you're never supposed to season them while soaking. Could that have been the case?? I really don't know why this would have happened. Do you soak the Beans the night before???? I'm very interested in making this but I want to know what the cook time would be in an InstaPot? Everybody knows real cowboys eat Pinto Beans!!! LOL!!!! So hearty, definitely a crowd pleaser!! And easy too, love these! We had cowboy beans at a branding one time in Wyoming and loved them. I've wished a million times that I had asked for that recipe. Can't wait to make this! These are easily one of our favorite side dishes. Thanks for sharing! I feel like I dont have enough liquid! I followed all instructions and put back liquid. Any suggestions? Maybe add a little water or broth? You didn't favor a brand of particular smoked sausage..... if you really want to "South your Mouth" I highly recommend Conecuh brand sausage if you can get it!!! BTW this is an awesome recipe !!! Hi Mandy! 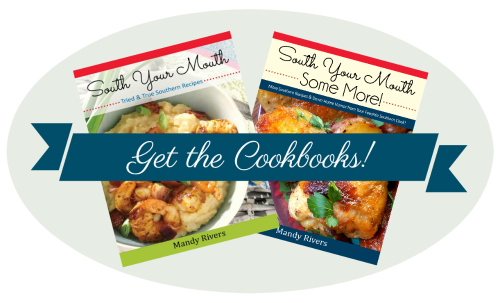 Have you had a chance to make the recipe as a main dish? If so, what changes did you make? This looks fantastic! I have used the Hurst Bean Soup before in the crock pot and just loved it, but your answer sounds right on point to me. A few jalapenos and some hot water corn bread and "Bob's your Uncle"! Gonna give this a spin, I have a family get together and I bet this will knock some socks off! Hubba hubba! Count me in! Beans are my favorite side dish for all grilling all summer long! What about in the Instant Pot, under pressure? With the dried soup mix? I'm not sure because I've never cooked with an instant pot.